A couple of years ago, two Glenwood students took the initiative to start a garden. 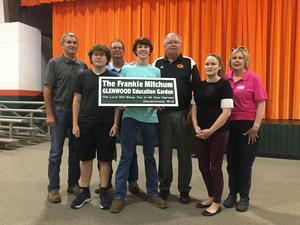 With much success and even more support, Glenwood dedicated the garden to our Headmaster, Mr. Frankie Mitchum. The Glenwood School garden has been a project that was a long time in the making. Georgia Lee Smith and I started searching for sponsors and getting teacher approval towards the end of the 2016-2017 school year. We spent over half of last year’s school year planning, designing, and searching for grants, and the other half bringing our plans to life. The Resource Conservation and Development board played a large role in the structure of this garden through the Wiregrass RC&D grant. This helped pay for the installment of a hoop house and the super soil to put inside of it. The Lee County Farmer’s Federation and Russell County Soil and Water Conservation District also supported us with generous donations that covered the cost of materials for raised beds and more soil. The plants to fill the beds and hoop house were donated from Bonnie Plant Farm. Mr. Bruce Boswell and my dad, John Curtis, put in a lot of time and effort installing the hoop house. We also want to extend a huge thanks to Mrs. Curtis and Mrs. Henderson for their support and encouragement with this project. We know it wasn’t easy, and we are very thankful for the help they have given us. Our goal for this project was to find a way to educate our peers in a fun, interesting, way, while making our school a better place. And this school garden will do exactly that. The space features several picnic tables to serve as an outdoor classroom, along with raised beds and a greenhouse for an easily accessible, hands-on learning experience. In the spring and summer, we harvested lots of corn, okra, and tomatoes from the hoop house. We grew zucchini, squash, watermelon, peas, and sunflowers in the raised beds. I was at the school almost every day this summer, watering, pulling weeds, and picking the vegetables. It wasn’t easy, but it paid off. We harvested over 200 pounds of vegetables from the garden in just one growing season. This summer, we donated them to the John P. Thayer YMCA, where Georgia-Lee and I both work, and we plan on looking for other nonprofit organizations in the area to donate to as well. This project is far from over and I cannot wait to see how it will continue to grow. We have been awarded a second grant from RC&D and work on that part will begin this fall. Next year, I will have graduated from Glenwood, and Georgia Lee will be a senior, but this garden won’t be going anywhere. We plan for it to be here for years to come, continuing to educate and inspire students. We also wanted to give a big thank you to Mr. Mitchum. He’s helped us out since the very beginning, approving an idea that two kids brought into his office. He has provided support for this project, not only from the school, but also from himself, every step of the way. He has done incredible things for our school, and we are very lucky to have him as our headmaster. For those reasons, and many, many more, we have decided to dedicate this garden to Mr. Mitchum in honor of him and all of the hard work he puts into this school and into our students. So we present to you, “THE FRANKIE MITCHUM GLENWOOD EDUCATION GARDEN”.